It’s funny how a simple photograph can completely capture a view of the recent past. I think this image would appear almost foreign to people working in the animation business today. It almost seems quaint and slightly crude. It’s the way animated films were once made. It’s a view of a time few would recognize today. Of course, those of you old enough already recognize the animator’s desk. That big silver platter in the center is called a disk. Drawings were affixed to it on pegs and the device could even rotate. For many years, artists managed to draw on these devices, and although it took some getting used to - over time it became comfortable. That’s a model sheet above the sketch. Artists kept these images nearby for continual reference as they went about their work. The yellow paper on the right is known as an exposure sheet. Critical in the animation process, it contained all the information needed in a particular scene. This fact filled sheet would also be used by the camera department when they photographed each individual drawing. In the world of animation, this was pretty much our bible. That white object in the animator’s left hand is called a cigarette. That’s pretty much a thing of the past as well. We’ve since learned to do without these items because smoldering ashes could land on the sketches and edges of the scene could be accidentally burned. Of course, That wasn’t the only damage they could do. They could also kill you. I might add that the sketch on the animators desk is not an animation drawing or a layout. It was something called a, “blue-sketch,” and several young women used to trace these things as part of the production process. Naturally, it’s simply another job that has been totally forgotten today. If you’re old enough and lucky enough to have labored on these ancient devices you may have fond memories of the forgotten process. There was something unique about being an animation artist and the fact that you were making a movie by hand. That’s correct. The process was totally analog and the human touch was felt every step along the way. Naturally, the physical process had its limitations and we were restricted to five levels because of the density of the animation cel. Even the camera had its limitations and that even included the mighty Multi-plane once considered a technological marvel. Despite these obvious handicaps, we were able to create magical worlds where elephants flew, and princesses were given life with a kiss. Worlds were created with watercolor and gouache and the animator’s pencil brought amazing characters to life. The pre-digital animation process for Walt Disney animation was clunky, crude and coarse. But, by god - it was magical and nothing like it is being done today. 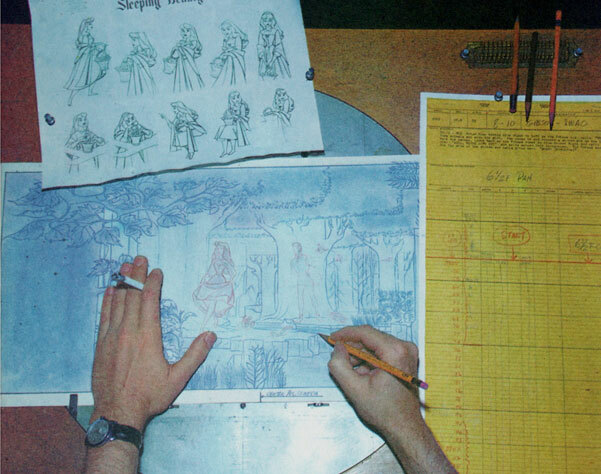 Today’s animation studios dismiss traditional hand drawn animation as inefficient and costly. That’s all bullsh*t of course, but the studios make the rules, and things are not about to change. As Frank Sinatra once said, “You can wait around and hope - but you’ll never see the likes of this again. The desk of a Disney animator. Compared to digital, the work was coarse, crude and clunky - but by god it was magical. April 20, 2017 by Floyd Norman.